We are pleased to announce the publication of the British Woodlands Survey 2017 report. 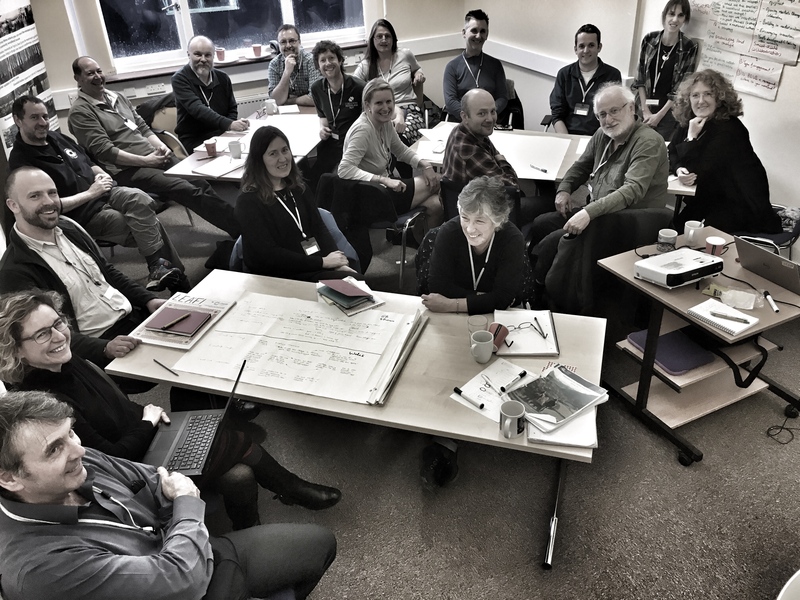 We adopted a ‘360-degree’ research method for British Woodlands Survey 2017, whereby stakeholders were engaged in designing the survey, providing data, and reviewing outcomes. Forty-eight workshop delegates ranked priority themes provided by 221 respondents in an initial survey, for UK countries: England, Scotland and Wales. Overall, Societal attitudes ranked highest, followed by Climate change adaptation, and Pests and diseases. 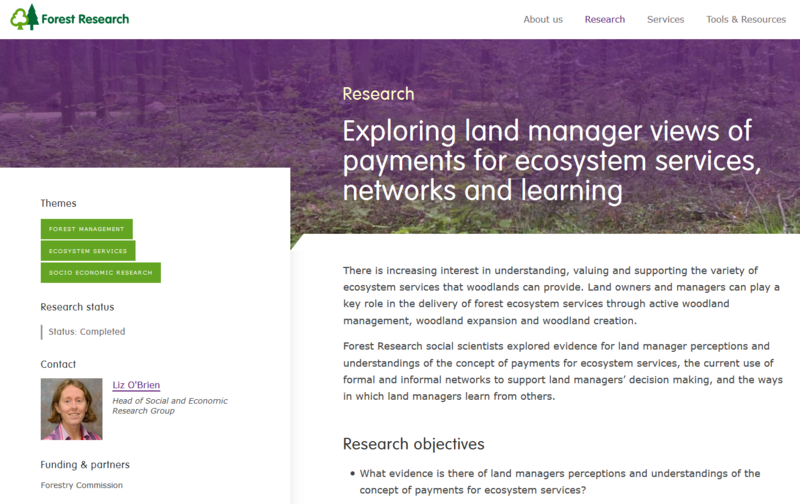 Within countries, additional top-ranking themes included: for England, Tree Planting and Timber Production; for Wales, Private woodland owner engagement; and for Scotland; Profitability and Natural capital. The main survey, based on these themes, was conducted online during summer 2017. Responses were received from 1,630 people, distributed across the UK. The majority of respondents (660) were private woodland owners, who together with 180 forestry agents, controlled 3,629 woodland properties covering 645,370 hectares. The response represented 28% of all private sector woodland area in the UK (2.30Mha), and one-fifth of the total UK woodland area (3.17Mha). Top motivation for woodland owners is protecting and improving nature. 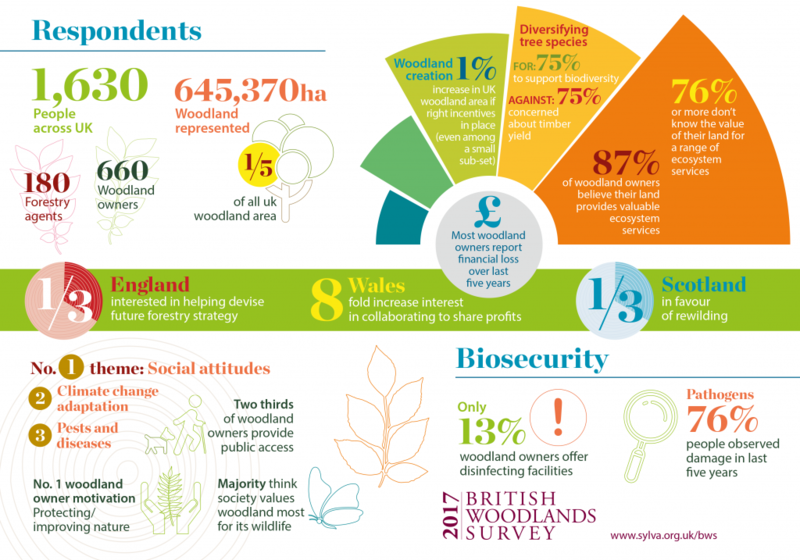 Most owners think that society values woodland most for its wildlife. Many in the sector want to engage more in developing policy but feel their voices are not heard. There is enthusiasm for diversifying tree species to support biodiversity but concerns among some about impacts on timber yields. Among a small subset of respondents (230) there would potentially be enough land made available over the next five years which would lead to a 1% increase in the UK’s woodland cover. BWS2017 was led by researchers from Forest Research, Sylva Foundation, University of Oxford and Woodland Trust. Funding was provided by Scottish Forestry Trust, Forestry Commission Scotland, and Woodland Trust. 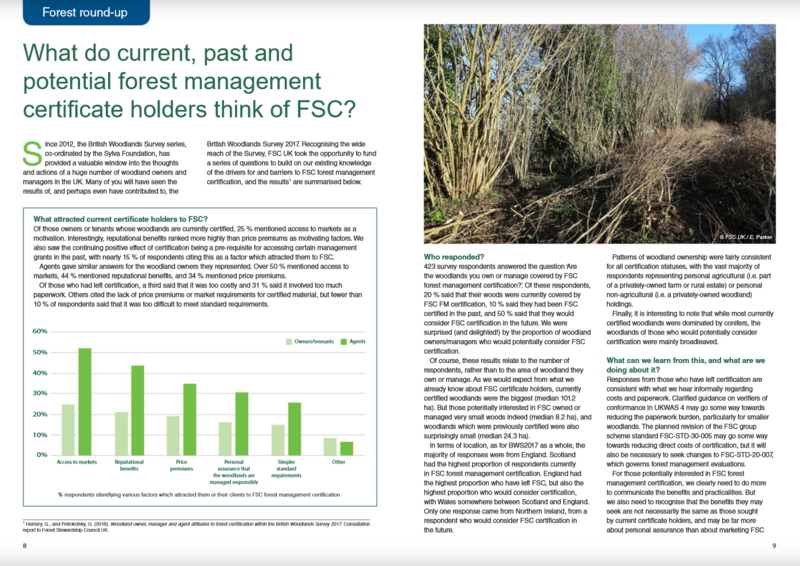 The last BWS, which focussed on environmental change, represented 11% of all privately-owned forest land in Britain with 1500 stakeholders taking part in the survey. This year we are asking questions around priority themes already suggested by some 400 stakeholders, plus themes of specific interest to England, Scotland and Wales. BWS has a proven record of working with important forestry organisations in Britain to provide a solid evidence base that influences decision-making, and contributes to policy. If you are a woodland owner or manager, farmer, land agent, professional forester or forestry/wood business, please take part and help shape the future of forestry. The survey is open until the end September. BWS2017 is led by researchers from Forest Research, Sylva Foundation, University of Oxford and Woodland Trust. Funding for BWS2017 is provided by Scottish Forestry Trust, Forestry Commission Scotland, and Woodland Trust. 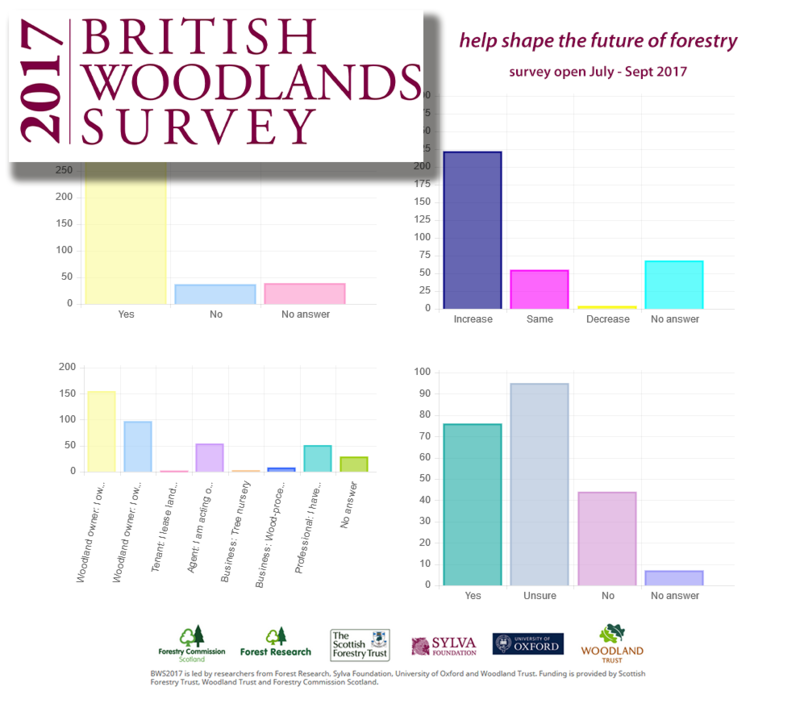 Since launching the British Woodlands Survey 2017 (BWS2017) two weeks ago we’ve received an encouraging uptake, with 500 respondents completing the survey to date. Thank you to all those who have taken part so far, and to our many partners in helping promote the survey to their members. 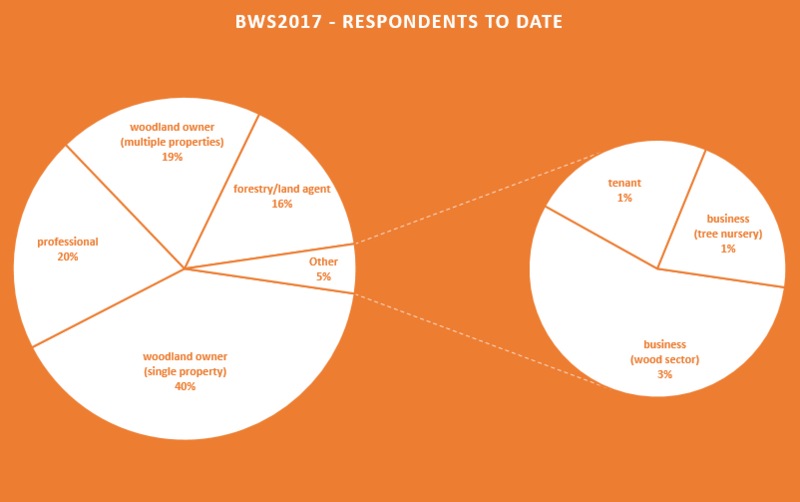 The last BWS, which explored issues relating to environmental change, represented 11% of all privately-owned forest land in Britain with 1,500 stakeholders taking part in the 2015 survey. 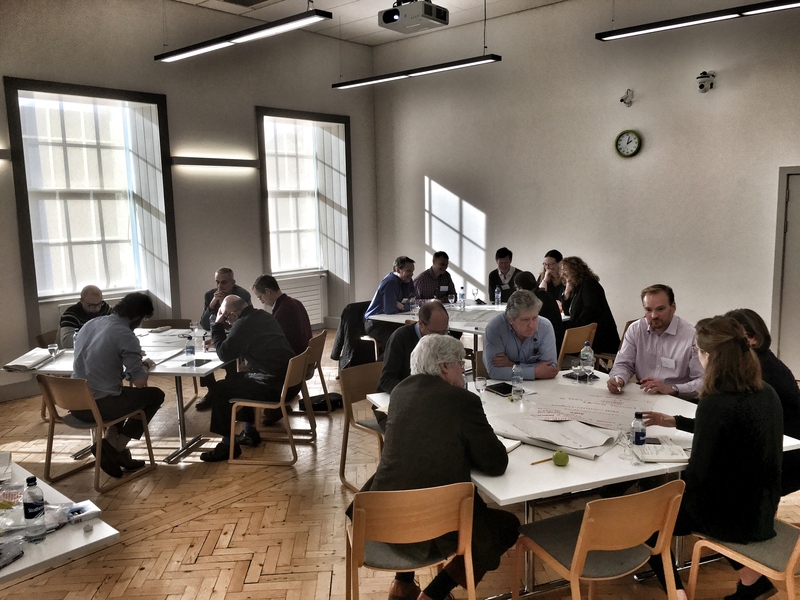 This year we are asking questions around priority themes already suggested by some 400 stakeholders, plus themes of specific interest to England, Scotland and Wales. For example, those with interests in Scotland and Wales were particularly focussed on land reform, while those in England wanted us to ask questions about tree planting. Other major themes include developing the wood chain, and societal benefits. 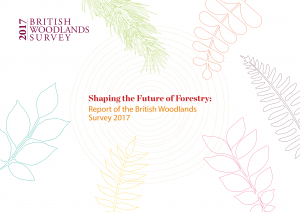 For the 2017 survey we hope to attract the best response so far; afterall this will make the findings even more powerful as an evidence base to help shape the future of forestry. The survey is open until to end September. 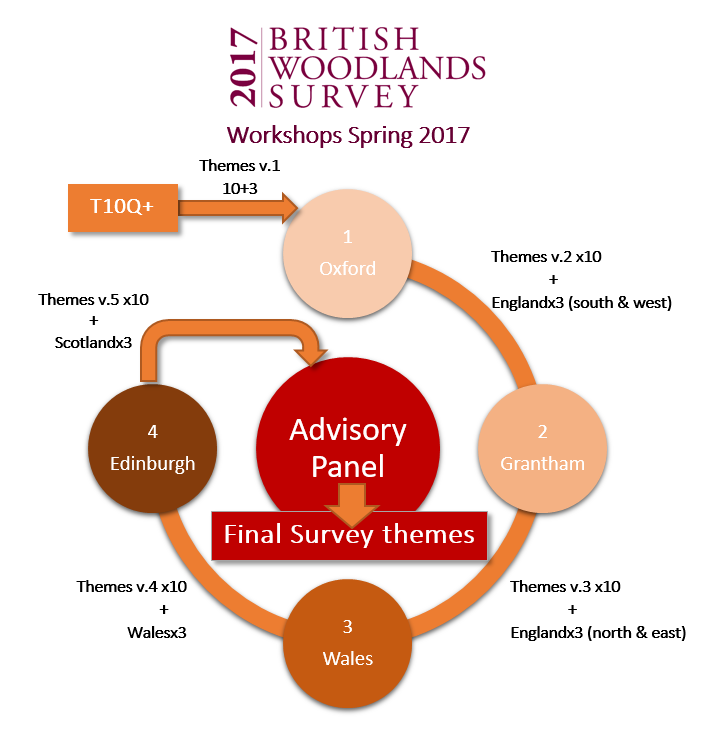 Following a successful stakeholder workshop yesterday in Edinburgh, we have completed Phase 2 of the British Woodlands Survey. 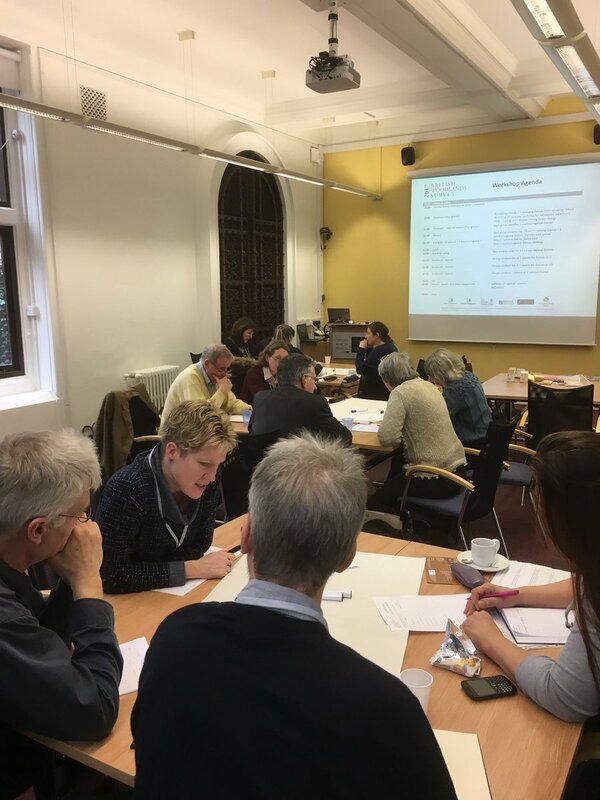 The 40+ delegates from workshops held in Oxford, Grantham, Machynlleth and Edinburgh have worked together to prioritise the themes for the main survey, which will launch in June. They also identified priorities for each country, which we will use in the survey to question stakeholders about key issues of regional or country significance. Summary results of the four workshops are shown in the graph below — it is interactive so hovering your mouse of the bars will reveal more information. Note that the two English workshops have been combined. The top GB-wide theme was Societal Attitudes, followed by Climate Change Adaptation and Pests & Diseases. It is interesting to note how much contrast there was between some countries for certain themes; for example the low important attributed to Tree Planting in Wales, and Managing for Carbon in England. These results will help us in concentrating questions in the survey to fit with themes or priorities considered most important across GB and its countries. 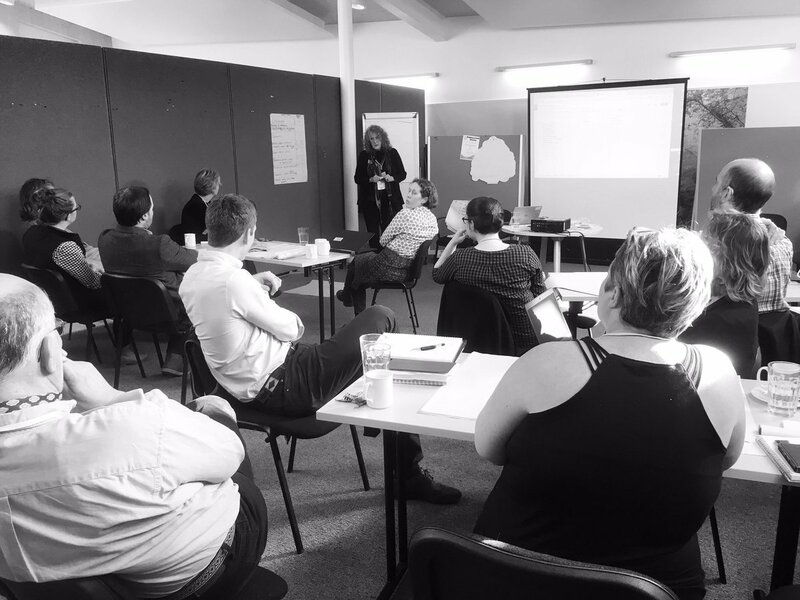 We are very grateful to all the participants, hosts and funders for helping make these workshops so productive.